There were plenty of boxing fans who questioned Showtime's decision to put the welterweight fight between Robert Guerrero and the little known Yosihiro Kamegai as the main event of its show on Saturday at the StubHub Center in Carson, Calif., rather than going with the featherweight title fight between Vasyl Lomachenko and Gary Russell Jr.
As often happens with fights at the StubHub Center, the Guerrero-Kamegai bout turned into a memorable slugfest that fully vindicated Showtime's choice to highlght it as the main event. Lomachenko, perhaps shockingly, easily outclassed Russell and won an easy decision to claim the vacant WBO championship. But Kamegai put up a far stiffer than expected test, nearly closing Guerrero's left eye, and the bout turned out to be one of 2014's finest. But as good as the Guerrero-Kamegai fight was, it struggled to make my Top 10 of the best fights ever held at the StubHub Center. Formerly known as the Home Depot Center, the venue has developed a reputation as Los Angeles' Olympic Auditorium had years earlier for regularly putting on some of boxing's best fights. 10. Brandon Rios KO3 Urbano Antillon, July 9, 2011 -- Antillon lost a 12-round decision to Humberto Soto in 2010's Yahoo Sports Fight of the Year and, as a reward for his great performance, was given a bout with the then-unbeaten Rios. 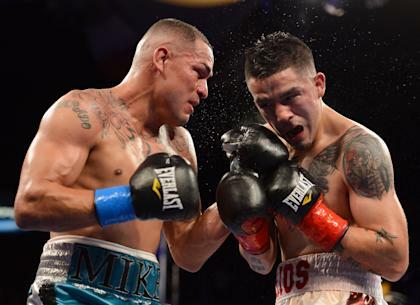 They went at each other savagely, but Rios was too big and too strong. He knocked Antillon down twice in the third, the second time for the 10-count. But there was plenty of hard-hitting action in the three rounds to get it on this list. 9. Paul Williams W12 Antonio Margarito, July 14, 2007 -- Williams used his jab and volume punching to blunt Margarito's relentless charge in an action-filled match. Margarito, as is his custom, never stopped plowing forward at Wiliams. But Williams kept a jab in Margarito's face and dropped in plenty of left hands to score the victory. 8. Robert Guerrero W12 Yosihiro Kamegai, June 21, 2014 -- Guerrero was coming off a 13-month-plus layoff since a loss to Floyd Mayweather Jr. Kamegai was not expected to provide much of a challenge, but he stood right in front of Guerrero all night. The fight was fought in extremely close quarters, with the men almost shoulder-to-shoulder the entire time. The drama came when three consecutive Kamegai shots closed Guerrero's left eye and made him open to repeated rights. But Guerrero hit harder and landed cleaner, pulling out an entertaining win. 7. Erislandy Lara TKO10 Alfredo Angulo, June 8, 2013 -- Lara had been tagged with the unwanted moniker of boring, but he was anything but that when he met the aggressive Angulo. Angulo stalked Lara, but the Cuban's boxing ability and accurate punches led him to the victory. Angulo dropped Lara in the fourth and in the ninth, but Lara overcame those to stop Angulo. 6. Lucas Matthysse KO11 John Molina, April 26, 2014 -- Two guys who are never in a bad fight got togetehr and put on a classic. Matthysse was down twice, in the the second and fifth, as Molina got off to an early lead. But Matthysse rallied and dropped Molina in the eighth and 10th before a crushing shot in the 11th ended it dramatically. 5. Marcos Maidana TKO6 Josesito Lopez, June 8, 2013 -- Josesito Lopez has regularly taken on bigger and stronger opponents and put up incredible battles. He was overmatched again on this night, but for four rounds, brought the crowd out of its seats as he engaged in a toe-to-tue slugfest with Maidana. Maidana is one of the game's hardest punchers and that's never a good strategy. He wore Lopez down and finally stopped him in the sixth. 4. Rafael Marquez TKO7 Israrel Vazquez I, March 3, 2007 -- Marquez and Vazquez fought four times in a three-year span, and each of the first three were classic battles. The rivalry kicked off in heated fashion, earning Yahoo Sports 2007 Fight of the Year honors. Vazquez broke his nose and was unable to breath, so he quit on his stool at the end of the seventh round. 3. Brandon Rios TKO7 Mike Alvarado I, Oct. 13, 2012 -- Expectations were high for this fight and the fighters delivered, as they each landed crushing blows throughout. There were few clinches and no lulls in the action. Rios hurt Marquez with a big right, then jumped on him and finished him on the ropes as the crowd went wild. 2. Timothy Bradley W12 Ruslan Provodnikov, March 16, 2013 -- In Bradley's first bout after his win over Manny Pacquiao, he met the then-unheralded Provodnikov. Provodnikov nearly stopped Bradley in each of the first two rounds, and Bradley admitted he fought most of the fight with a concussion. But he rallied to control long stretches by using his boxing in what was named the Yahoo Sports 2013 Fight of the Year. 1. Israel Vazquez W12 Rafael Marquez III, March 1, 2008 -- The third fight between them was one of the best fights of all-time and tops my list of the best fights ever held at the StubHub Center. Vazquez went down early, but knocked Marquez down in the dramatic 12th round, when only the ropes kept Marquez on his feet. The referee ruled that a knockdown and the clutch effort in the last round allowed Vazquez to pull out the win and take a 2-1 series lead. 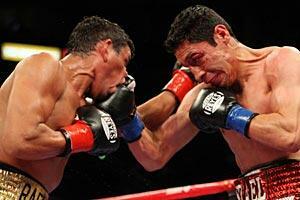 Rafael Marquez (L) and Israel Vazquez engaged in the best fight ever at the StubHub Center, on March 1, 2008.